It is over. Another Frocktober has passed by in blur of frills, patterns, florals and petticoats. I've worn a different frock every day (and still had a few spare) and loved it - but I'm hanging out to wear my jeans tomorrow! There is no doubt that I'm a frock loving gal, but my jeans are also favourites that I have missed. But of course Frocktober isn't really about the frocks, it is about the fundraising for the Ovarian Cancer Research Foundation. The funds raised will be well used by them to fund their ongoing research into an early detection test for this terrible disease. And the fundraising has been amazing. This year I've managed to raise $3,386 and currently the total for the whole month is $ 279,752.45!!! It is just a brilliant result and will make a real difference for the OCRF. 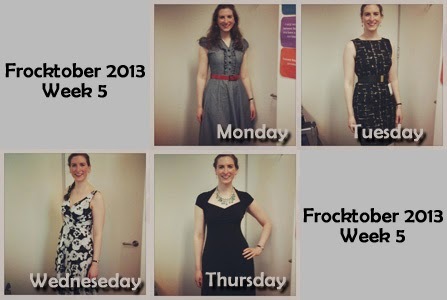 There is still time to donate, my page is https://frocktober.everydayhero.com/au/lisa but there are many others doing amazing things to raise funds who could also use your donations. Thank you for coming along on this year's journey with me. As always it has been a fun, humbling, memory filled ride! Well done Lisa, that's quite an effort!! Congrats on your fundraising efforts! i participated in Frocktober too, and was so excited to be able to wear jeans and shorts ny the end!